I learned how to make chicken rice recipes in ever form from a soup, a casserole to a stir fry. Whatever you are making, this is a great combination to use together. The juices left from roasting a chicken and the rich broth when cooking a chicken are great seasonings for rice. Rice is a rather plain tasting grain but what is so wonderful about it is that it takes on the flavor of whatever you choose to cook with it; plus rice is good for you. Chicken is always delicious whether it is smoked, grilled, fried, boiled, roasted, served whole or in pieces, even served hot or cold, with or without bones. What ever way you learn how to make chicken rice recipes you will find all recipes to be very popular. As you probably know, chicken has the greatest number of cooking variations; it is also the favorite around the world. 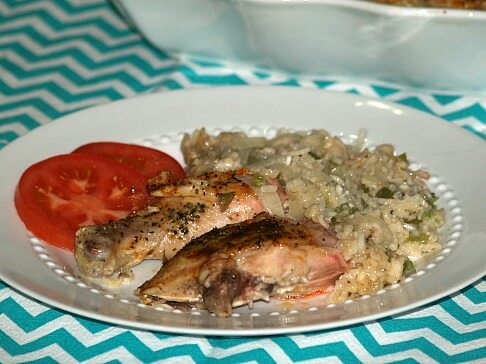 One very common chicken which I like and cook quite often is the Cornish hen; my favorite accompaniment to this is also rice. I usually cook wild rice in chicken broth with celery, onion and spices; then I stuff the Cornish hens before roasting. This is a very good entrée for special occasion dinners. Rice is the oldest food known to man. Rice blends well with a variety of different ingredients. When I learned how to make chicken rice recipes I found these to be the favorite. There are thousands of different types of rice worldwide; you will find several of these in your local grocery store. Some rice has a stronger flavor than others, some take longer to cook and the health benefits vary according to the variety. All this is a matter of preference to your taste buds but I do not know of any which does not go well with chicken. Depending on what additional ingredients you put in your recipe, they can change the entire flavor of the dish. When you add ingredients like pineapple and soy sauce, chicken rice recipes are given an Asian flare. Melt butter in a large skillet. Add garlic and chicken pieces. Brown on all sides. Drain liquid from vegetables in the bottom can of the divider pack. Pour liquid over chicken. Cover and simmer until chicken is tender. Now add the pineapple,green peppers, and the vegetables and sauce from the top can of the divider pack. Stir in curry powder and soy sauce. Add salt and pepper to taste. Cover and simmer until green peppers are tender. To serve: Spread 1/2 to 1 cup of rice on plate. Layer chicken mixture over rice. Serve hot. Some chicken rice recipes are baked together in the oven; this allows for the chicken flavor to be absorbed in the rice making it delicious. Butter a large casserole dish. Spread rice in bottom of dish.. Sprinkle with dry onion soup and pour in water. Place chicken on top. Spoon soup over all, coatimg each piece of chicken. Bake uncovered for 2 hours at 350 degrees. Dirty rice recipes are chicken rice recipes using white rice and the chicken livers or giblets instead of pieces of chicken. These are traditionally Cajun dishes with a lot of spice and flavor; because they are made with these parts of the chicken and white rice they are economical to make. In a large Dutch oven, cook flour and oil over low heat to make a brown roux. Add onions and stir until brown. Add chicken livers, celery, parsley, scallions, green pepper and garlic; stir to blend. Add cayenne pepper and season with a little salt and pepper; cook over medium for 5 minutes. Add ½ cup of chicken stock; stir and cook 15 minutes. Cook rice in remaining chicken stock until liquid is absorbed about 20 minutes. Fold rice into vegetable mixture; add more seasoning if desired. 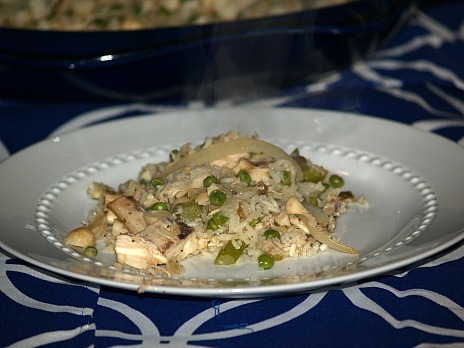 Many chicken rice recipes are in the Chinese cuisine; cashew chicken is my favorite. I love the ginger in this one and I like to sprinkle soy sauce on top. Reserve half of cashews; combine remaining ingredients in a large bowl. Dump mixture in greased casserole baking dish. Cover and bake for 45 minutes or until rice is tender and chicken is done. 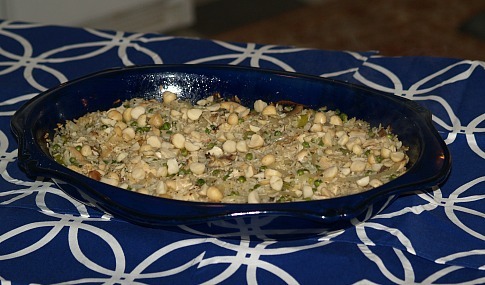 Sprinkle top with remaining cashews. Can soups, like cream of mushroom soup, make a good binder and add much flavor to chicken rice recipes; soups also help to make dishes have moister. Cooking in the microwave makes it a quick meat to put together. Combine and blend in casserole dish rice, onion, soup, water, green pepper and salt. Arrange chicken pieces on top; brush with melted butter. Sprinkle with paprika and green onions. Microwave on high covered for 30 to 35 minutes; rotate dish half way through cooking. Leave covered and rest for 10 minutes; check to see if rice is tender and chicken is done. This chicken rice recipe has lots of flavor. Rinse frozen shrimp and peas with cold water to separate; drain. Mix all ingredients in a large skillet; break up tomatoes. Heat mixture to boiling stirring occasionally; reduce heat. Simmer uncovered for 5 minutes; cover and let stand about 10 minutes before serving. 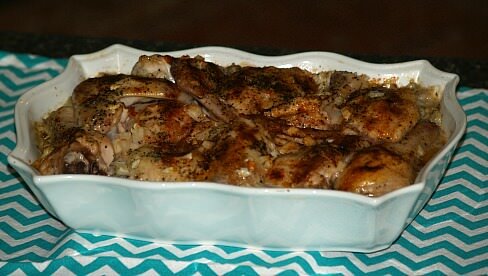 Place chicken pieces in ungreased rectangle baking dish; 9 X 13 inches. Sprinkle with salt, paprika and pepper; bake uncovered 30 minutes. Heat broth to boiling; remove chicken from baking dish and drain fat from baking dish. 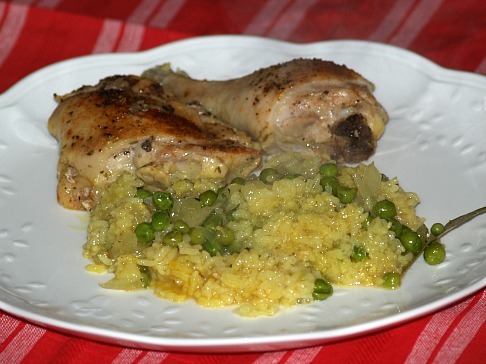 Mix broth, rice, onion, garlic, oregano, turmeric, bay leaf and peas in baking dish; top with chicken. Cover with foil and bake 30 minutes or until rice and thickest parts of chicken are done and liquid absorbed. Remove bay leaf; garnish with pimiento strips and black olives if desired. Mexican is a favorite cuisine even with chicken rice recipes. Learn how to make Mexican rice with this simple Mexican rice recipe. It is all in the seasoning which usually means tomatoes, garlic, lime and of course jalapeno peppers. Oh so delicious! Brown chicken on all sides in hot oil in large skillet. Stir in remaining ingredients except Velveeta; bring to boil. Reduce heat to low; cover and simmer 20 to 25 minutes or until liquid is absorbed. Add Velveeta cheese; cover and cook until Velveeta is melted about 2 minutes.